Spring has arrived (or at least according to the calendar it has! ), and it’s time to put away those heavy layers and try out some fun Spring trends. A visit into most stores these days will have you seeing visions of pastel colours, off the shoulder tops and floral prints, to name but a few. However, as moms we don’t have a lot of time to invest in figuring out the trends and seeing which ones work for us. The trick to getting it right is to keep it simple and avoid getting overwhelmed. Sonia our fashion style expert from Styleiish breaks down the trends so you can make easy decisions, know what is wearable, and what fits in with your #momlife! “Florals? For Spring? Ground-breaking”— said Meryl Streep as Miranda Priestly in The Devil Wears Prada. Although it may not be “ground-breaking”, it’s the truth…florals are BIG this season! Although they’ve been around for several seasons now, there’s just something new and fresh about the spring florals. The lighter colour palettes, the softer prints…they just scream Spring! Any easy way to incorporate florals into your wardrobe is choosing one piece and building your outfit around it. For instance, start with a dress in an easy, flattering cut and add some ballet flats or sneakers and a denim jacket, and you have the ideal Spring outfit. Or choose an accessory, like a scarf or hat and wear it with basics like a white T and jeans. - The cutest scarf from H&M! The off-the-shoulder/cold shoulder trend is also one that has carried over from previous seasons. There’s something women love about showing off their shoulders that has provided this trend some strong staying power! 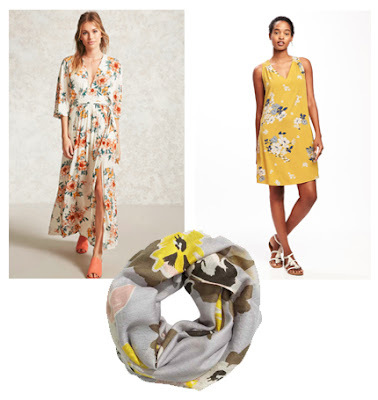 There’s an abundance of ways to show a little shoulder, my favorite being the flowy OTS dresses that are everywhere right now. All you need is a nice sandal, and maybe a necklace to really make those collarbones pop, and you have a fun and easy spring outfit. If you want something other than a dress, the cold-shoulder tops are definitely having their moment. Pair one with jeans for a casual look or a skirt for something dressier. You are going to see sleeves in many different types of cuts and lengths this season, some being a little too over-the-top for the typical closet. The bell sleeve however, is a subtle nod to this trend and is very wearable. Just be sure to keep the rest of your outfit simpler, and make the top (or rather, the sleeves!) the focus! 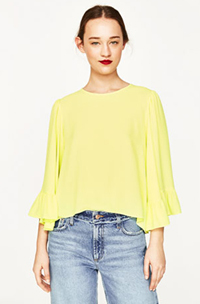 Check out this fun bell sleeved top from Zara! Some love it, and some love to hate it, but Pink, in all its glory, is a resident colour of Spring. The great thing is that there are so many shades of it, ranging from a blush to fuchsia, that anyone can find a pink they like. Try a light pink coloured jean with a chambray denim top to ease into it. Or go all out with something bright and cheery… either way, you’ll look ready for Spring! - Pair these bold pants with a subtle print to stand out, or black and white for a classic look! 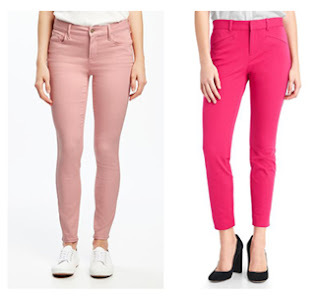 - Or try these if bright pink is not your thing! We hope this helps ease some of that shopping anxiety that many moms can feel. If you have any specific questions about the trends mentioned, or would just like some more advice, contact Sonia as she's always happy to help. You can reach her at styleiishss@gmail.com, or visit our website www.styleiish.com for more information. Be sure to visit the blog again for next month’s style post!